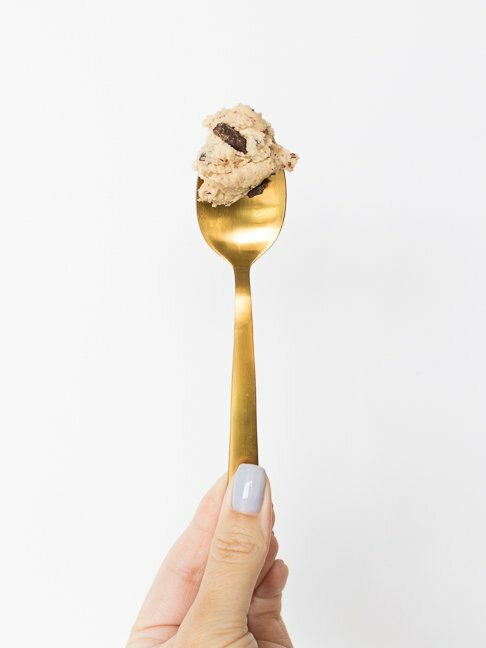 Honestly, I’ll take raw cookie dough over baked cookies any day of the week! But because I know the risks of eating raw eggs, I wouldn’t allow kids to eat it, since raw eggs can make them sick. That’s where eggless cookie dough comes in. Now, I just make a batch of eggless cookie dough to keep in the fridge or freezer for when the craving strikes. Problem solved! 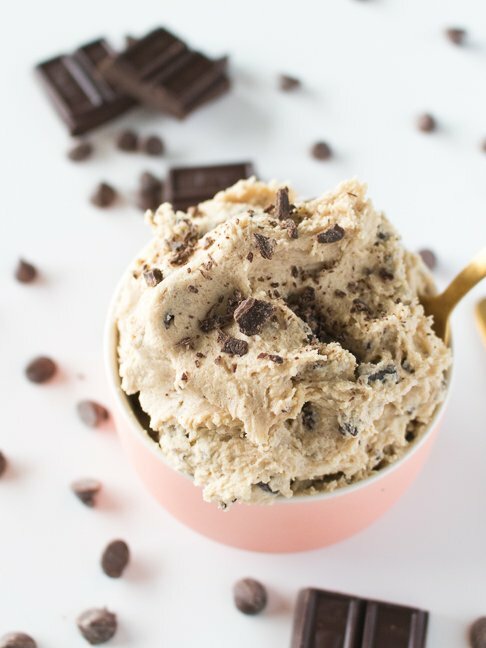 And here’s the thing: Making eggless cookie dough is just as easy as dough with eggs; you simply add a little milk or cream instead of the eggs.You can even make this recipe dairy free by using almond or soy milk. Without the eggs, the milk simply adds the necessary moisture to achieve the right texture. Because you won’t be baking the dough, you don’t have to worry about whether the ingredients will bake properly — just focus on how delicious it tastes! 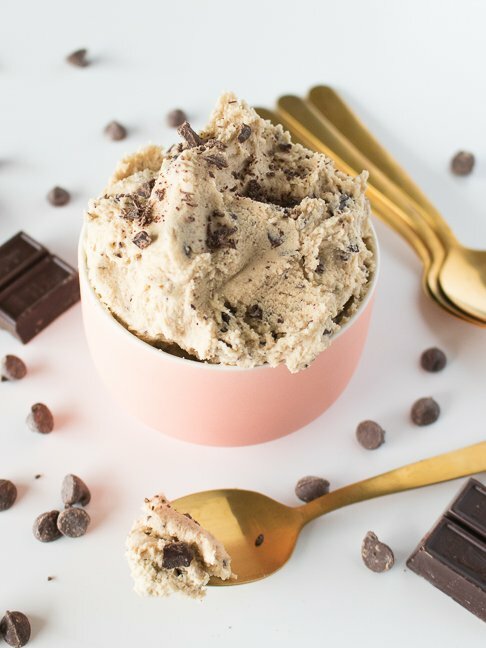 The eggless cookie dough pictured here was made with chocolate chunks, but you can add in other mix-ins, like peanut butter chips, strawberries, M&Ms — whatever you like! Once made, the cookie dough will last about 7 to 9 days in the refrigerator in a sealed container. For longer storage, roll the dough into balls and freeze in a sealed container. You can eat the dough frozen or allow it to soften. 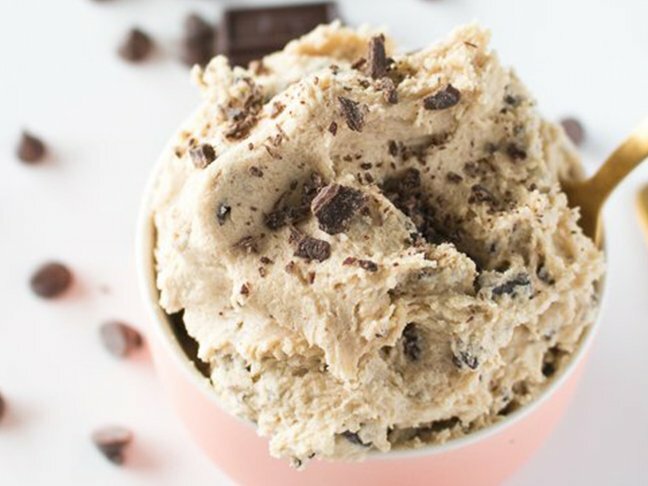 Here’s how to make cookie dough kids can eat (that tastes exactly the same)! That's right: All the goodness of regular cookie dough, without that one ingredient that could make you sick. Step 1: Melt the butter in the microwave for 30-40 seconds. Pour into your mixing bowl and let cool for several minutes. Step 2: Mix in the sugars until smooth, and then add the vanilla. Add the flour and salt and mix until slightly crumbly. Step 3: Add the milk one tbsp at a time until the dough is smooth. Step 4: Stir in the chocolate chips/chunks with a spatula and store in an airtight container in the fridge for up to 9 days.